Steak night for the special date night in. The most tender, decadent steak cut that is perfect for a Valentine’s Day date night at home. When you want that steak to come out perfectly (and who doesn’t? ), you cook it sous vide. Steak night at home is way cheaper than going out, and it’s probably a lot better and more fun too. When it comes to a date night in, it’s nice to have most of the work done but still have a little fun and interaction together in the kitchen. After all, that’s what makes a dinner date night at home different from going out. 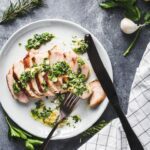 The sous vide makes guaranteed perfection a reality and does most of the work for you ahead of time. The filets can be vacuum sealed ahead of time so they are ready to go right in the sous vide water bath. 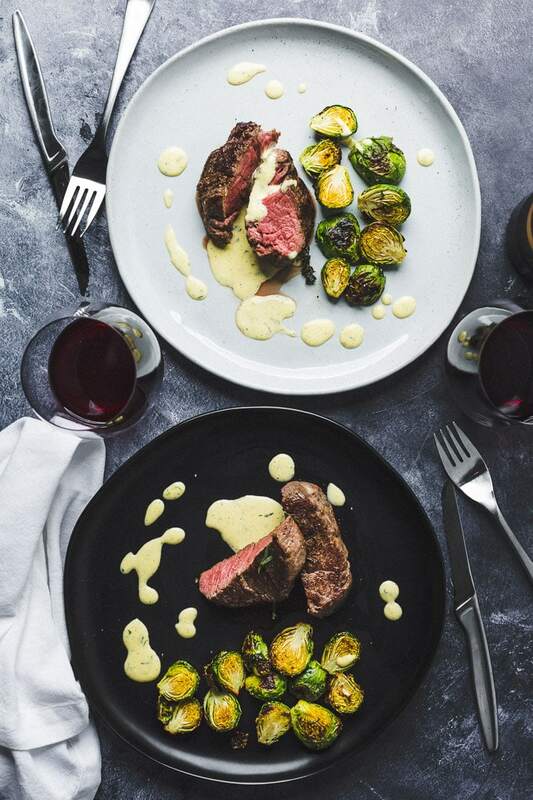 Since these are filet mignons and quite delicate; you might want to skip salting the steaks until right before you sear them rather than ahead of time. You can even sous vide the filets ahead of time, then chill them in the bag, then re-warm in a water bath at 110 degrees for about an hour before searing. Since the steaks only take an hour to cook anyway, it sort of defeats the purpose. It makes more sense to pre-cook when it’s a piece of meat that takes lot longer to cook. 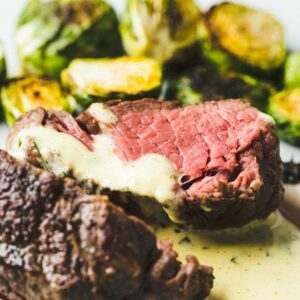 For the Béarnaise Sauce, you can totally make it ahead of time and reheat it slowly in a double boiler while the steaks finish. It’s not a sauce that takes long to make, but making ahead does make things even easier. 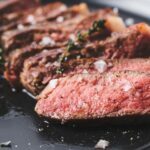 Check out my full post on how to sous vide any steak. Heat the water according to your sous vide machine’s instructions to 130° F / 54.4° C for medium-rare steaks, or to the desired finished temperature. Season the filets liberally on all sides with Kosher salt and freshly ground pepper. 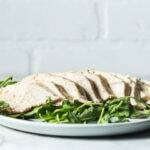 Place a thyme sprig on each side of the filets, then place it in a vacuum seal bag or ziplock bag. Vacuum seal the bag if using a vacuum sealer, or if using a ziplock bag; partially seal it removing as much air as possible, then place it in the water to push the rest of the air out before sealing. Sous vide the filets for 1 hour at 130° F.
Remove from the water and rest for 10 minutes in the bag. Remove from the bags and dry with paper towels. Season with a little more kosher salt. Sear the steaks for about 30 to 45 seconds on each side in a very hot skillet with enough canola oil to coat the bottom of the pan. Add a few tablespoons of butter and the thyme sprigs to the skillet and continually baste the steaks while the sear. 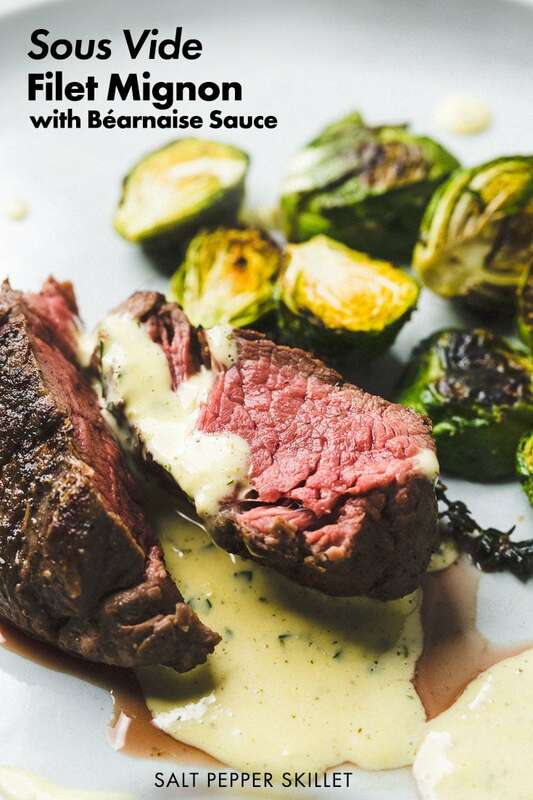 Serve immediately with the Béarnaise Sauce. Place the vinegar, wine, chopped shallots, half of the tarragon, 1/8 teaspoon kosher salt and some pepper in a small saucepan. Bring to a boil over medium heat and simmer for about 5 minutes to reduce the liquid to just a few tablespoons. Cool slightly. Place the cooled liquid with the egg yolks and 1 teaspoon salt in blender or hand blender container and blend for 30 seconds. Slowly drizzle in the hot butter while the blender is on to create an emulsion. Add the rest of the chopped tarragon and pulse a few times. With blender on, slowly pour the hot butter through the opening in the lid. Add the remaining 2 tablespoons of tarragon leaves and blend only for a second. Keep the sauce warm (but not hot) before serving. 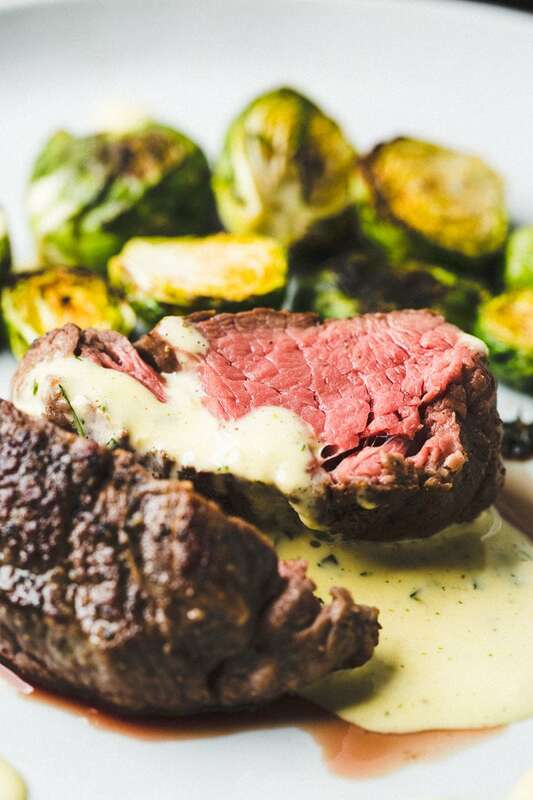 If the béarnaise sauce is too thick, you can blend in a little white wine to thin. The sauce can be made ahead and reheated over a double boiler. Season, sous vide, sear. Seriously it’s that simple to cook the most delicious perfect steak every time.